What’s more important than your business revenue? You guessed it right, it’s your customers. Without customers there are no steady revenue streams. The focus around customer happiness and satisfaction grows big and evident. Keeping customers happy means that they will want to come back and refer it to their friends. It goes on and your business grows. You’re doing so many great things for your customers, it’s rare to see such behavior in the first place. But what if you’re not keeping your customers engaged? What happens then? Of course those customers who need your product are still going to buy it, but the relationship between you both won’t feel as authentic. To reinstate that aspect, businesses need to adapt to the idea of engaging customers into your business practices. The best way is through online surveys. With surveys we can talk directly to the customer, regarding their issues and feedbacks. If we’re careful enough, we will spot patterns and repeating suggestions that indicate it is time to update the product. We could also be hearing good feedback, and suggestions about the features users like to use the most. You could survey your customer base about upcoming changes, or perhaps give customers an opportunity to suggest products of their own. The possibilities are endless, and it really creates a great atmosphere at the company. Starting an online survey has gotten awfully easy in the last 5 years. Lots of versatile alternatives exist for launching an online survey, and we’re here to countdown some of the more prominent ones. 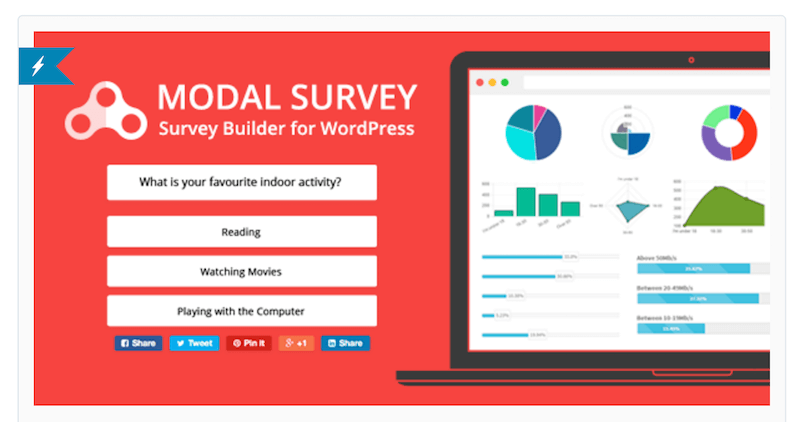 We will explain all the tools in three different parts: survey tools for universal use, survey plugins for WordPress, and premium plugins for creating surveys with WordPress. And essentially you can combine either of the categories to be used on WordPress. We have to start our list of tools and plugins with standalone services and platforms that provide survey form capabilities, this is because forms are usually external entities either way, separated from the core functionality of your website, and more often than not with the use of an external forms platform you also get more insightful tools and analytical capabilities to understand your forms performance, that also includes custom themes for your forms, and guidance tutorials from those who own these platforms in the first place. You’ll find many WordPress bloggers back those statements up as they themselves sometimes rely on survey tools that would otherwise be intentioned for standalone and general websites. KwikSurveys snagged the opportunity when it arose to introduce a web based survey building that although focused on simplicity, still manages to provide features beyond basic survey creation. Kwik’s main products are survey, quiz, and poll builders that will enhance your relationships that you have with your readers and customers. Surveys can be built with unlimited number of questions, with concise analytical reports that give you impeccable insight into your own audience. The survey builder is interactive and offers many ways to use algorithmic logic for creating surveys that would meet the needs of your business. 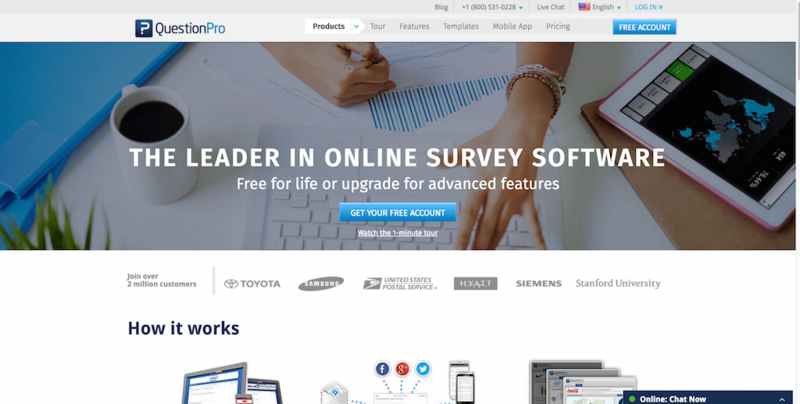 SurveyPlanet’s extensive set of free features is the ultimate survey building tools to get insight in how customers see your product. 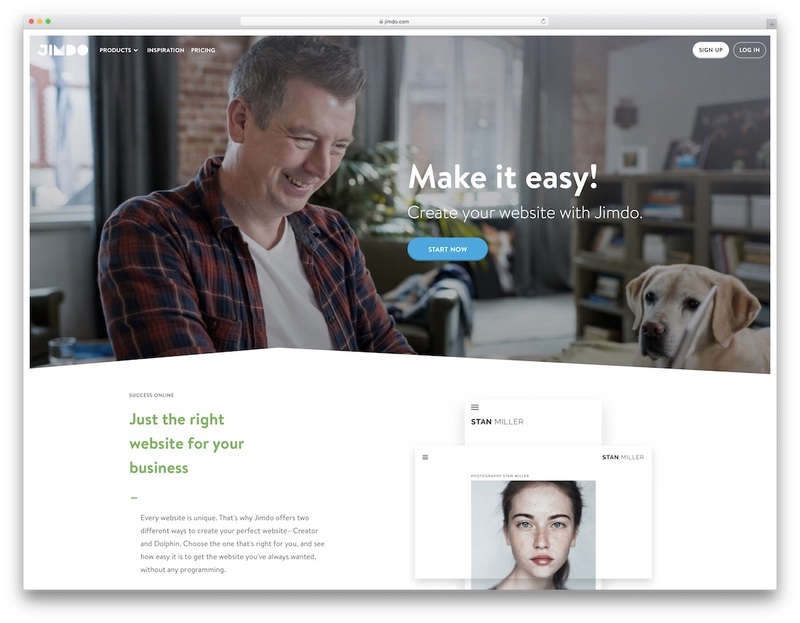 While free plan users can enjoy the selection of ten unique survey themes, paid plan users can actually customize and build their own survey designs that would compliment an existing website design. 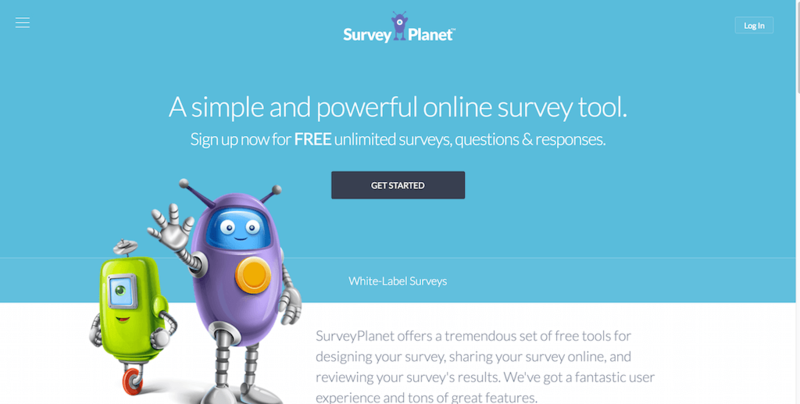 Same paid plan lets SurveyPlanet users upload visual content for more engaging and interactive surveys. Worry not though, because all themes (whether free or paid) are compliant with responsive web design. Not only is the builder rapidly fast, the surveys themselves are coded so that they take up as little resources as possible, so you’re always optimized for performance. SurveyPlanet also takes into the account the business of those who wish to do extensive surveys and questionnaires, and provides customers will pre-set questions that will help you run campaigns on many different aspects of understanding your current customers and audience. Logic can be implemented to base questions on the kind of responses that your audience has already answered, helping you to segment particular audience for future content. SurveyMonkey is the leading software for online surveys, with millions of customers (including Fortune 500 companies) around the globe, SurveyMonkey establishes an easy to follow roadmap for business persons who want to learn about their customer happiness, engagement, and desires where product is concerned. Start today by signing up for free. Do you ever find yourself wondering, what exactly are your customers thinking and saying about your products? How about understanding where your customer satisfaction is coming from? Sure, you can browse TripAdvisor, and Google for reviews, but how often are those reviews direct responses to questions that you’re asking your customers? 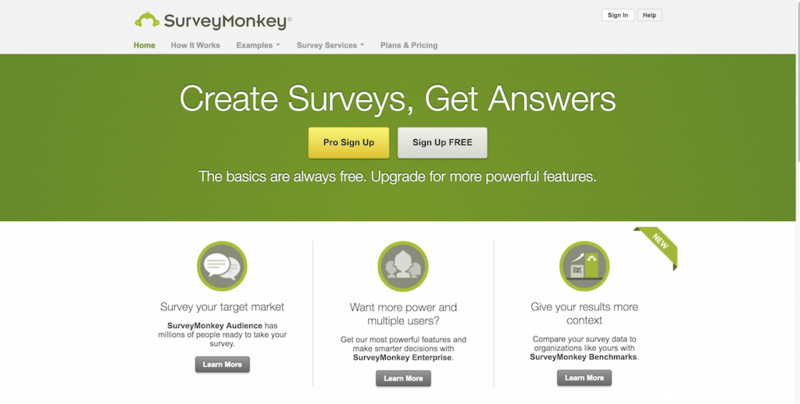 SurveyMonkey provides customer survey templates for multiple scenarios: customer satisfaction, market research, events, education and human resources. Combining these scenarios can yield you great insight and outlook on why your customers are satisfied or dissatisfied with your product, and where your possible next areas of growth are located. Like others, SurveyMonkey also supports the idea of segmenting your audience after the results have been counted it, since segmentation offers so many ways of targeting specific audience for specific offers. Survicate is one of the world’s leading platforms for gathering customer insight. As an All-in-One platform, Survicate helps businesses to make the most of their existing or potential customer relationships through carefully designed survey and feedback tools. The sophisticated questions features allow for business owners to craft a truly versatile feedback form based on custom specifications and needs for the given campaign. Social and user-feedback integrated system ensures that your content will always reach your users, even long after they have completed the form. eSurv found that to grow an idea it is necessary to offer a free way for web owners to investigate the pain points of their audience, and so with that vision on their shoulders — eSurv provides a forever free online survey maker. Built as a platform for university students and researchers, eSurv is able to maintain the free price tag thanks to generous donations from those same people. Create surveys with unlimited questions and unlimited answers, and forget about having third-party ads show up anywhere. eSurv ensures that customer data is protected using both server-side and client-side protection methods. All collected survey responses can be exported externally as Excel or CSV documents. eSurv users can customize their surveys with branding options for both colors, and logos. An API is made available so that you can plug eSurv in your favorite apps that you’re using for your business growth already. LimeSurvey doesn’t need an introduction if you’ve been around for the last 5 years, this open-source survey software has been able to define many milestones for how an seemingly minimal open-source software can capture the hearts of so many millions of web users and developers. The applications of LimeSurvey are beyond the reach of an average online survey builder that your neighbor might recommend. With LimeSurvey you can: create customizable marketing surveys, create psychological surveys and tests, create a customer satisfaction survey after a sale has been finalized, create interview surveys to weed out unqualified contenders, create custom event invitations to understand the needs of attendees, theoretical tests for things like license tests and more. It is completely pluggable with custom templates and custom plugins, plugins such as secure authentication methods, export methodologies, and data protection so you can sleep soundly at night. FreeOnlineSurveys certainly managed to grab itself a premium domain in this market, and often you have to ask yourself — can such a domain live up to its name? And in this case, it most certainly can, the website design is exceptional, and the features involved for building your new surveys are just as exceptional too! 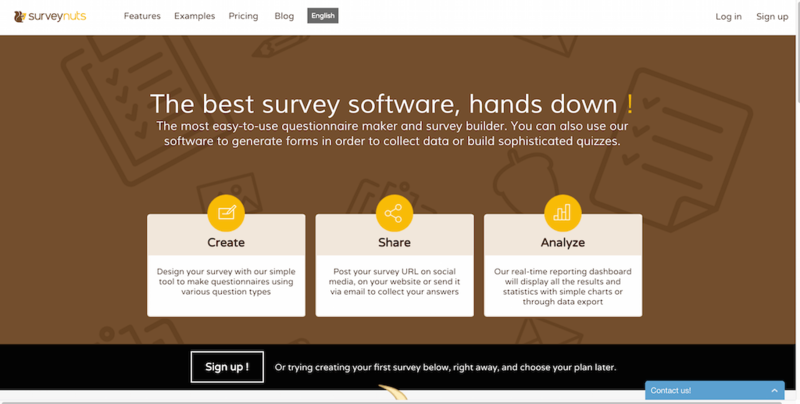 You can choose between surveys, quizzes, forms, and polls to create from a single dashboard. The integrated survey logic helps you to create the kind of questions that would lead up to a concise audience segmentation, those segments could then be used to deliver customers tailored news, product offers, and insights that would further strengthen your bottom line. 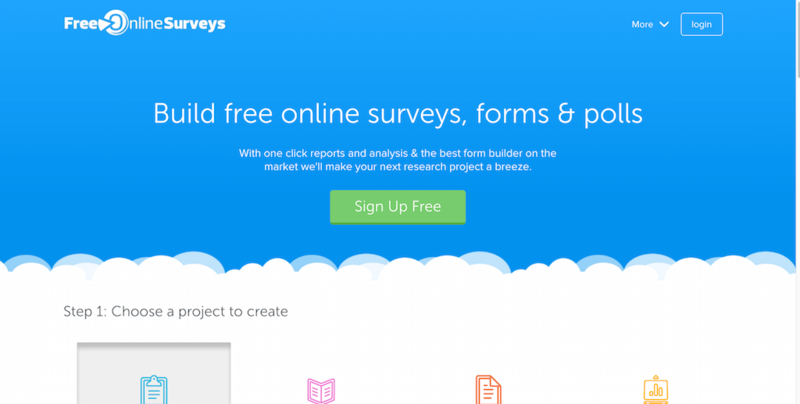 Brands don’t have to stress over using a free survey builder, since customization of how the surveys look are all in your own hands. All those custom options span across the different range of form types that you can build. 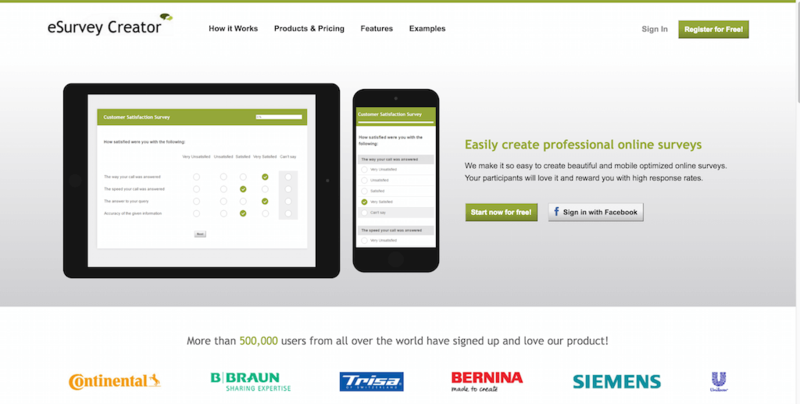 If it wasn’t for customers such as Vodafone, Siemens, Porsche, and Nikon — majority of developers would think that eSurvey Creator is just another sham, a lousy attempt at providing webmasters with a functional survey building platform. But eSurvey Creator does have those clients, and thousands of others who have benefited from the many great features that this tool provides: extendable questions, logic workflows, visual content, custom survey themes, add media content, custom redirects, responsive mobile design, password locking, custom time limit for survey completion, dynamic integration. It actually has an enormous list of features that keeps going on, so it makes more sense now that such luxury companies would rely on this professional software to interview their customers. The free plan can feel quite limiting, but if you’re working in corporate business, a slight investment for customer understanding can go a long way. Beating your competition doesn’t always come down to the way you build your products, but the way you understand your customers instead. It’s the customer that ends up making the product, and if no priority is being put over the way you understand the needs of those who maintain the success of your business, then someone else will come and do it for you. That’s sort of the description that SoGoSurvey is trying to approach with their survey product. With SoGo you can start right away, the pre-built survey templates help you get started with questioning your customers in just a few momentarily interactions. The visual reports give you concise visualize data reports of responses that your surveys are generating, that data can be used immediately to improve your product, but also to create case-studies about specific survey campaigns that you’ve run. Sometimes it doesn’t hurt to share the data with the public as it serves as another free marketing channel for your business. Zoho runs such a vast and diverse range of products, sometimes people question whether those products have great quality reassurance, and yes, in fact they do! It took its time to evolve as a reputable online business company that solves problems in marketing, sales, IT departments, support departments, and email marketing categories. Zoho Surveys considers themselves as a unique survey service because of a select few specific features, those are things like offline-support for building surveys when you’re not connected to the web, once online you can upload them to Zoho servers, or use your own hosting; whichever works best for you. All surveys can be translated into dozens of languages, and you can connect with Zoho Email Marketing or MailChimp to send surveys directly into email campaigns. And as all business minded people know, without data there isn’t much to understand, that’s where Zoho gives you real-time access to your survey reports as they keep coming in. Who wouldn’t trust their data to Google? So many of us already do on daily basis.. we give Google our emails, our advertising money, social information, and in some cases even our own digital enterprises, yet Google continues to deliver with products that surpass the functionality and productivity of standalone desktop software. Google has converted the Microsoft Office Suite into a digital enterprise on its own, offering Docs, Sheets, Slides and Forms as separate Google products available in the digital space. 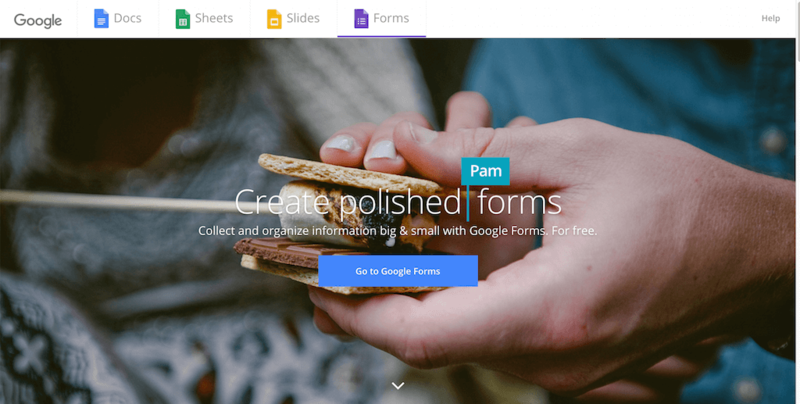 Google Forms is also used in situations where you’re required to launch a survey campaign, because as a Forms tool — it can take care of any task where user input would be concerned. Whether you’re looking to gather a few answers about your product, or create concise questions and answers forms — Google Forms can solve those mysteries rather effortlessly. The documentation, but also countless online tutorials provide different perspectives on how Google Forms can be beneficial to business planning, and rest assured that there are many of such perspectives out there. Typeform is the product you get when you put together a bunch of creative and skilled people, and execute the idea of building the world’s best forms builder. That’s how you come to Typeform. 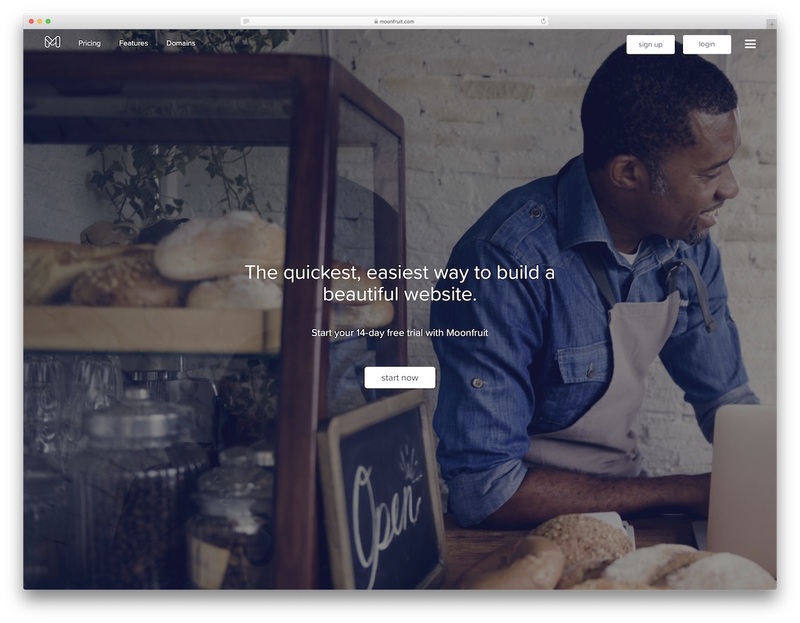 Their exceptional vision and approach to unique web-based forms haven’t gone unnoticed. While we won’t scold the many other beautiful and truly useful forms builders we’ve already portrayed, Typeform manages to stand out as the professional choice for design lovers, and meaningful forms seekers. With Typeform you can organize information that your customers give you through a full-screen forms process that not only takes your own breath away, but keeps your customers glued to their screens as they experience revolutionary engagement experience. 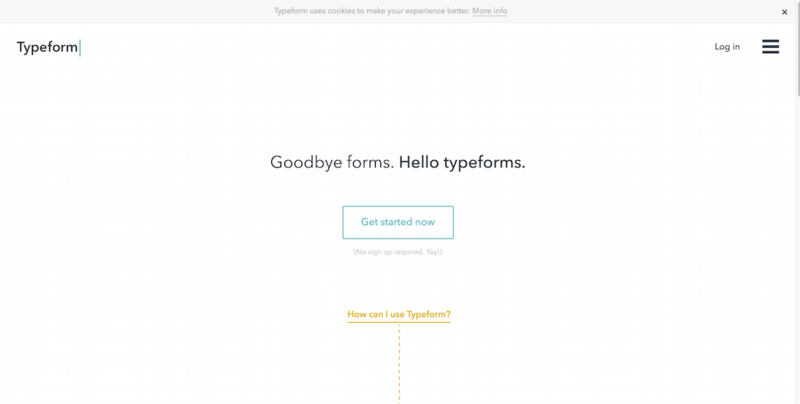 The name Typeform comes from “typing forms”, this means engaging forms that engage the user throughout the journey of the form itself. Whether you’re collecting job applications, suggestions, reports, or basic contact form necessities — Typeform does a wonderful job at ensuring that whatever you’re promoting to your audience, it will keep them engaged. Typeform also works in the following scenarios: market research, branding research, post-event research, polls, registration forms, lead generation, signup forms, medical forms, order and delivery forms, booking and donation forms, and quiz forms. Let alone we’ve only touched the surface of Typeform, and we encourage you to look in-depth at what this product has to offer to your business, it might be life-changing! SurveyGizmo’s full featured approach to surveys has won the hearts of many tech oriented developers, business owners, and webmasters who want to truly understand their customers. Where do we even begin with such a vast pool of features. It all begins with tailored questions that can be used to dwell deeper in the psyche of your audience to meet their goals and expectations. 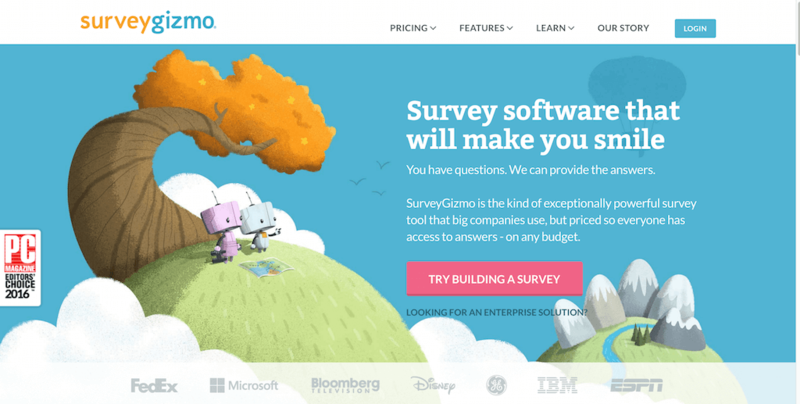 SurveyGizmo won’t enforce its own layout upon your forms, so you remain in control of colors, layout types, sizes, links, everything that a custom design survey form would need; branding as it needs to be. Forget about sending out a campaign and waiting on data to analyze, everything happens in real-time as the answers begin to roll in. All data can be promoted through social media or business channels like email for easier exposure and access. 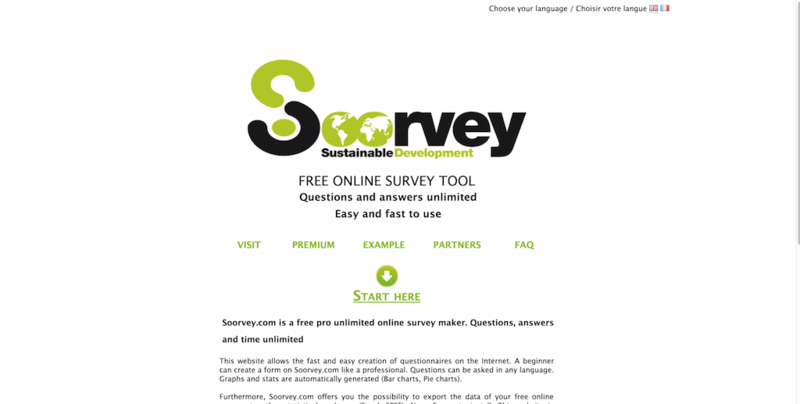 Soorvey has a superb and professional take on flexible web-based surveys that include single, multiple, checkbox, rating, ranking, custom answer, matrix, and suggestion based options that all can be implemented into a single survey, ready for collecting that deep insight of your customers thoughts about anything that you’re surveying. As with all such forms builders, it can be easily converted into many uses, such as job interviews, or collecting post-purchase feedback. Imagination is the limit here, and since that is the case — the uses are unlimited! The purpose of a survey sounds easy enough, right? Create some question forms and launch the campaign, easy enough! But that’s just the beginning of a long journey of understanding which questions work the best, and what can be done with the answers that you’re being given back. It all starts with the length of your surveys — making them too long is going to scare people away, but making them too short might not give you the right insight you’re looking for, unless you tailor some truly unique questions that would cover your campaign goals. SurveyNuts also likes to emphasize the use of photography in surveys, and tell us that photo’s generally increase engagement, and understanding of what you’re surveying for. Then you’ve the option of publishing or not publishing the actual results, but as research shows — the latter is a wiser choice because it makes those survey participants feel more valued, and gives them a sense of community accomplishment. That is sort of the framework that this survey builder begins their helpful work, and you can read more up about it on their features list page. At the end of the day it will come down to how happy your customers are, and whether you’ve insured their satisfaction levels for years to come. That’s the first lesson of business, to listen to the customer and truly understand their concerns, because once you do — you can integrate new ways of solving problems and providing solutions, all the small things that make your business more trustworthy, reliable, and credible. Starting from the first welcome email that you send them, to discussions that happen over live chat widgets, you can move on to surveys to dig deep into the mindset of your customer and begin nurturing a long-standing relationship with them. QuestionPro is an industry known business that always encourages its customers to put their customers first, since that is what makes the journey of profit possible. Alright! What a list so far. 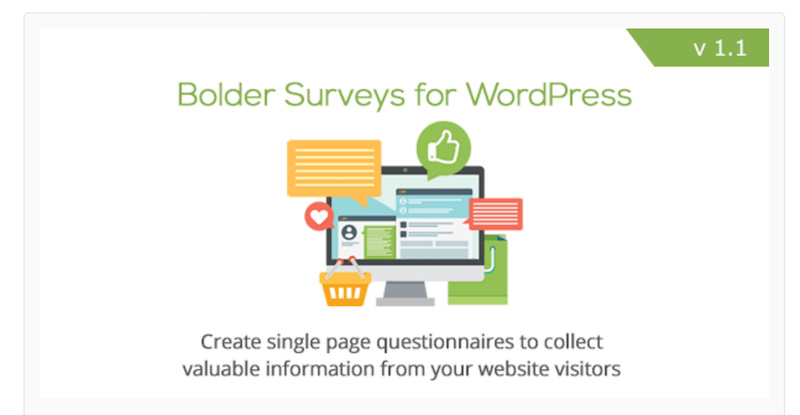 We covered the tools that majority of web users today use when they’re not using WordPress, and now we can take a peek into what WordPress plugin developers are making to help bloggers launch survey forms on their blogs. These are mostly unique platforms and tools that we didn’t see in the standalone roundup, but there’s a possibility that some of the more older tools will have developed their own WP plugin as they understand the market that such plugins can reach. Once again, explore and understand your goals for surveys, and then the process of choosing the right plugin won’t be so hard. Surveys don’t need be difficult, or complex, or sophisticated. Knowing real-time what your users are saying about your product, website, or service is very helpful. It can give you a new direction for your business goals. Surveys from Feedback Cat is a dynamic WP widget that creates a simple popup widget in the bottom-right side corner. It asks new users whether they’re satisfied with their browsing experience (you can modify the questions yourself). It simple Yes or No will open up a feedback form where users can share the experiences that their experiencing. The feedback left through this widget is going to go to your email address, so don’t forget to whitelist the incoming emails, and don’t forget to free up some space too! IgniteFeedback widget provides a real-time solution for generating feedback from your WordPress blog visitors. You can create all kinds of variety of questions that your users could answer while reading or browsing your blog. You can do this through the interactive set-up dashboard. The effect of shortness and effectiveness really comes together in such a concept. The developers designed these surveys for modern blogs. You will naturally blend in with any responsive design theme you’re already using. If you’re asking single ended questions, then poll results can be shown after the user picks their choice. You could begin with simple questions like “How did you find our site?”, or “How do you like the user experience?” and with time you’ll be able to ask more concise questions. Not all survey plugins or tools need to be complex and aimed at lengthy questions. Simple and straight to the point feedback works too. This kind of diversity of different survey solutions was necessary. 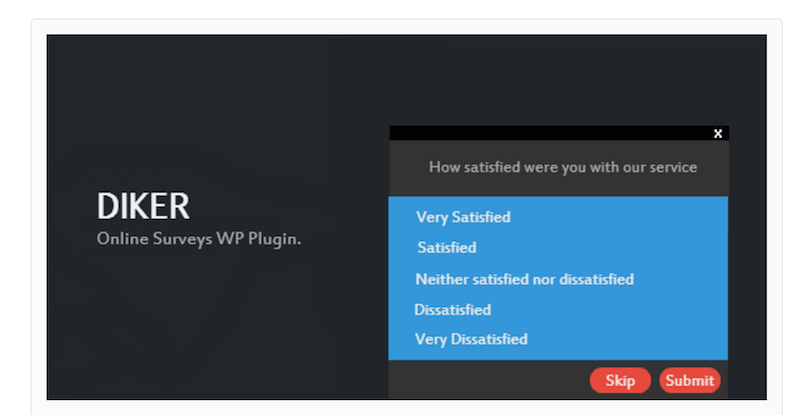 Now, you can see that many of the WordPress survey plugins heavily focuses around popup surveys. The developers presented it as small widgets during the time that readers are browsing your content. There’s nothing wrong with this approach of course. True startups and business companies will definitely want to investigate more methods for getting the concise feedback of their audience. 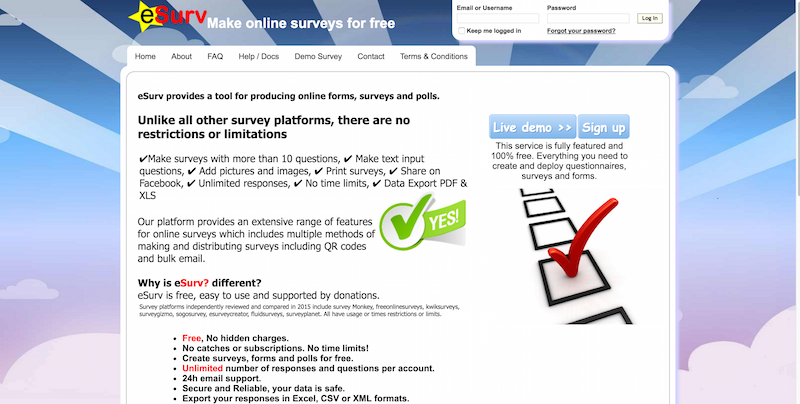 Mare is an excellent choice for a surveys and polls plugin that will increase your conversion rates. It can create authentic scores for your users and give you insights on why customers decide not purchase. You can use the dashboard to create as many surveys as you feel you need to. You can then enable and disable them individually. OpinionStage is definitely onto something here. We immediately recognize this kind of forms pattern because quiz sites and psychology test sites use it. Even media sites like BuzzFeed use this. They pretty much built their business model on top of question and answer type of forms. The developers don’t call it OpinionStage for no reason. It’s the one way ticket towards discovering the opinions of each of your users about the specific things. And regardless of the fact, you’re still boosting your bounce rates and pageviews. Your readers do this by interacting with surveys, polls and quizzes that you’re displaying both inside and outside of content. OpinionStage is compatible with running contests and special offers to reward your audience for being engaging. You can gather their details to get them to sign up to your email list too! It’s a vast plugin that doesn’t stop at the traditional purpose of giving you what the name implies. This is a much more diverse and magnetic plugin that excels at keeping your audience thoroughly engaged. WordPress Survey & Poll values and cherishes the feedback that comes from the users of your website, and with that kind of mindset you can enjoy a plugin that collects feedback from your users effortlessly. It has the support of modern web browsers and integrated responsive design. You will never miss on any single user when it comes to asking them for their satisfaction with your content. Users can also submit c about possible improvements you could make. You won’t have to struggle with preparing the polls or surveys either. 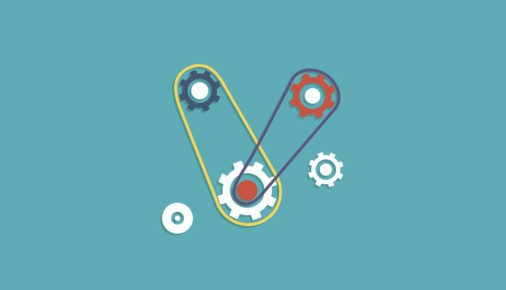 The plugin comes with a visual forms builder that gives you the customization freedom you seek. You can also apply custom animations and parallax that would suit modern designs and themes. Qeryz WordPress Survey creates sustainable micro surveys that instantly collect essential customer feedback. You can apply these feedbacks momentarily after receiving. Qeryz can easily manage all those tasks for you from whichever page that your readers browse your WP blog. You can do this whether you are expanding on the list of features. Also, you can use it if you’re looking for your audience to suggest you with content ideas. Alright we’re coming to a close now, since the options explored are so diverse enough already. We’re going to finish this up with PlanSo Forms, a universal forms builder plugin for WordPress bloggers. Why limit yourself only to surveys when you can literally create a user submission form for anything? And PlanSo makes it so easy. It’s absurd why anyone wouldn’t want to at least experiment with this kind of a plugin. PlanSo supports HTML5 (responsive design and cross browser support), it can align multiple form columns at the same time, you can customize each form input with a custom icon, it has a drag & drop interface for rapid forms prototyping, you can set up an automated email response after someone submits their PlanSo forms, spam protection is in-built and doesn’t require captcha to function, and because this magnificent feature recap keeps going on, you’ll have to check the documentation for yourself. Here are some of the most common uses for PlanSo have been. You can use it for lead generation, contact, registration, calendar, bookings and invitations, subscriptions, donations, and orders. Believe it or not, it can also do tax form management too! We’ve covered a Great deal of information. For the last part, we’re going to mention premium plugins for creating versatile surveys on WordPress blogs. Altogether, this might as well be the most comprehensive overview of the kind of survey solutions that exist out there. Don’t hesitate to recommend your own platform that you use in case you didn’t see it mentioned already. The following plugins have the advantage of an extended premium support package. This could d help you with integrating your survey forms. We’re sure that these forms would be best suitable for your business plans. Modal Survey considers the aspects of psychology when you’re required to dig deep for understanding your audiences. Although title suggests (modal) that this is a popup plugin, you can effectively embed it as a standalone widget. You can place it within your content area of WordPress posts. The polls that Modal Survey allows you to craft are not your traditional progress bar polls. It turns it into a step by step question and answer tasks that end up serving a specific result. In your case it could be the overall results, or you could use those polls to define a personality trait. The developers integrated it with Visual Builder support. 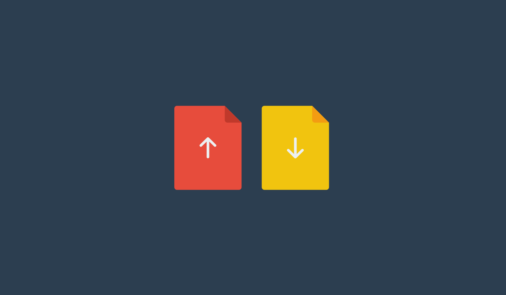 Anyone who uses Visual Builder already can plug away their designs with some new and interesting surveys and polls. The plugin provides much more features that helps you to save your time and reach your aims. The polls can appear for the users at once. It’s possible to set to display once for users who already filled out or simply can appear in every cases. Activate the poll with different user interactions. This includes things like link clicking, scrolling to the page bottom or even scrolling to specific parts. Each questionnaire is closeable or you can force the users to fill out in return for the hidden content. With Bolder Surveys, WordPress admins can finally enjoy the flexibility of creating surveys directly from the administrator dashboard. This surveys has modern and unique attributes that will produce and end-result worth sharing with friends and co-workers. The grid layout for the Bolder surveys means that you’re capable of combining multiple elements into a single survey widget. This could truly and extensively gather essential customer feedback which could then improve the user experience for everyone. The developers recorded all surveys in the database beautifully. Also, you can access them as raw data and visual data previews. New WordPress bloggers are going to overlook what many recognize as the ultimate norm for cultivating user feedback. That’s why we’re here to help and educate those who’re less experienced with understanding their readers, visitors, audience and customers. They need to continue exploring the needs of the audience as they progress further with growth and content expansion. Naturally Diker is elegant, with a user friendly interface that will compliment any existing WP design you’re using. Forget about the limits of surveys you can run. Diker gives you the chance to run one, two or even three campaigns at the same time. What’s more awesome is that you can stop them anytime as you like. If you are choosing to ignore your customer feedback, then your business will inevitably remain in the phase of standstill. Any future decisions after a certain growth period must be based on the feedback of your actual customers. That includes their satisfaction with particular products and their features, and their dissatisfaction with other parts of your business. Big companies like Google, Tesla, and others are constantly fighting the battle of being shamed and blamed. Also, they’re constantly investigating what their users want, and how users respond to certain changes. It’s amongst the reasons why Google has abandoned so many, seemingly useful products. It was because audience didn’t like them, and so they had to cut them loose. User feedback is invaluable. Emailing, surveying, usability testing, interviews, social media listening, analytics and feedback widgets are just the beginning of getting an answer to the burning question of “Do you enjoy using our service?” — from there on, you open yourself to a new world of exploration, and it’s all for the benefit of your own business. Great top, but if you wish to collect feedback throughout the whole customer journey online you should try out Feedbackly feedback widget. It is a great tool for managing feedback and it is easy to use. I personally like it and I am pleased with the results. You can also benefit from many features such as creating and triggering automated instant upsell offers based on the feedback given. Loved reading the article! That’s one mighty list of survey plugins 🙂 However, I can suggest one more plugin that can be an excellent addition to your list. 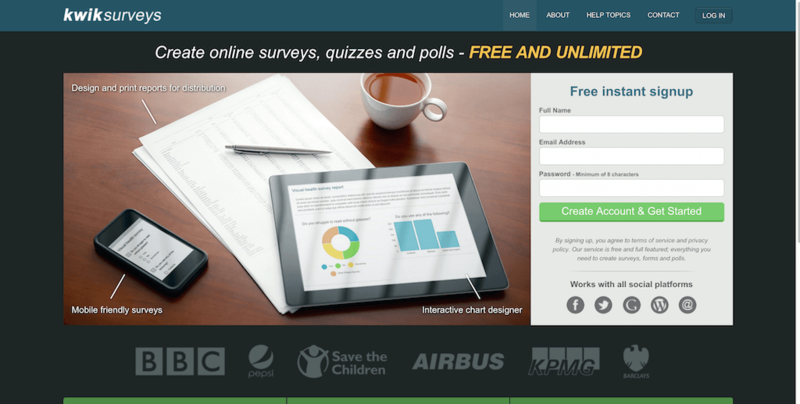 Survey Funnel is a fantastic WordPress survey plugin. You can take a look at it. Hey, I am in search of a “What is your location” pop up with drop down to select the location and a submit button. So survey came inside my mind. Am I on the right track? Any help? I believe this is what you are looking for. There is no WordPress plugin just for that but it comes part of many directory themes and plugins where location is important. great article! I would add just one more tool to the list – Survicate (to make it clear, I work here). 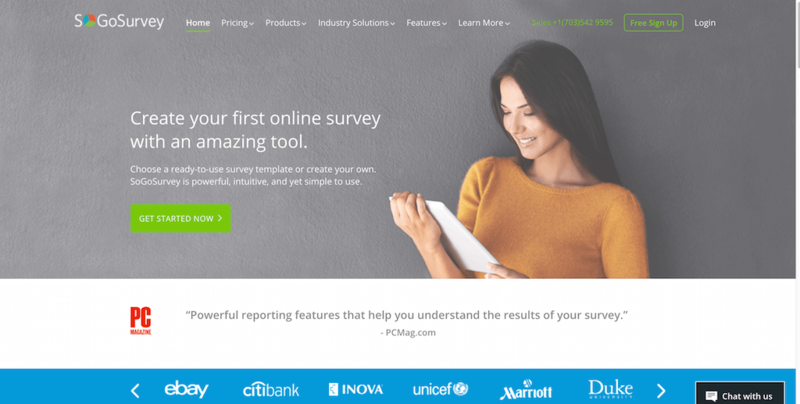 After a recent product update, Survicate offers targeted website surveys, feedback widgets, one-click email surveys, NPS email surveys and questionnaires. No more need for multiple tools to collect customer feedback across different digital channels. Plus, we have a WordPress plugin to make getting started easier for those who want to use website surveys and feedback widgets. Thanks for such a great list! This is for sure helpful for many websites developers and bloggers. I am personally interested in one specific feature of surveys plugins – to generate for each user who had taken the quiz a unique share link, so that later I could see who invited each survey user for my website. Can you maybe recommend me any plugin/tool with such a functionality? I am personally interested in one specific feature of surveys plugins – to generate for each user who had taken the survey (not made a purchase) a unique share link, so that later I could see who invited each survey user for my website.